An area that now benefits from vision, that affects us all, is transportation and traffic. Monitoring of traffic and in particular Automatic Number Plate Recognition (ANPR), has changed the face of our roads, but there has also been considerable use in railway applications. from motion detectors, barriers being raised, pressure sensors etc. detect foreign objects such as explosives hidden under vehicles. There are many examples of the use of vision technology on the railways both trackside and mounted on the trains themselves, even though the operational conditions are demanding. Cameras and imaging systems can be exposed to extremes of weather, vibration and physical wear. Line scan technology is being used to inspect the rails, sleepers and ballast for early detection of failure at speeds over 100 MPH, to a resolution of 0.8mm. 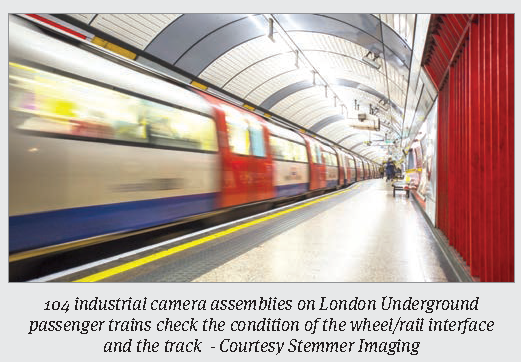 Used in conjunction with cutting-edge pattern recognition software, this can automate the detection of track defects to help increase the safety of the railway network in a way that was previously impossible.